During the last week of February, the first BPS inspection in Hemet (California, USA) took place. Judges G. Stelwagen and R. van Tijen were present on behalf of the studbook. The inspection on the property of Pieter Franken was organized to perfection. Stallion Willem 2 van den Meulenpad (owned by C. Brohman) obtained 47 points and as such, was approved to be a BP stud. His new name is Boudewijn BP26. Boudewijn BP26 (f. Willem van Nassau) also obtained a positive ridden IBOP, with 63.5 points. To top it off, he also passed the driven IBOP, by receiving 50 points. 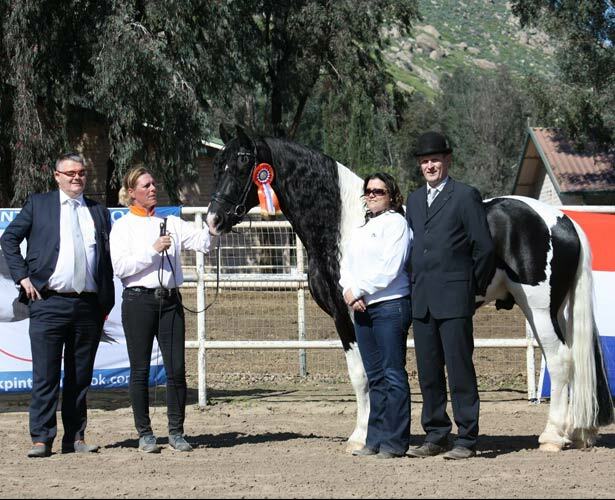 Stallion Elvis TCB (f. Peter BP04) obtained 42.5 points, which declared him Ster with a breeding license. His new name will be Elvis Ster 52 (owned by H. Quaddi). Additional information on these studs can be found in our stud database.